Here’s An Inside Look At What Goes On Behind The Scenes. 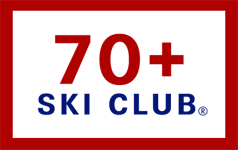 When I covered my first World Cup ski race many years ago, I was really naive. I thought the winner would be awarded a huge silver trophy. I was disappointed to learn that racers earn points. No trophy. But my race stupidity gave me an idea that I’ve pursued ever since. Maybe readers would enjoy an inside look at what goes on around a major race venue. Not just the champions. Not just results. Other stuff. Here we go. 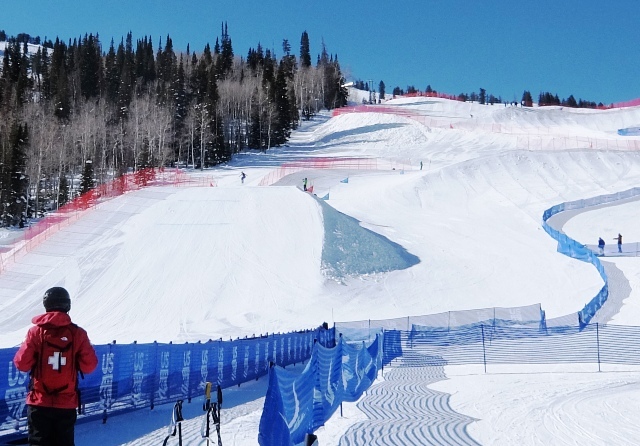 For 10 days in early February, 1,400 elite amateur athletes from 40 countries come to Utah to compete in the World Snowboard and Freeski World Championships at three Utah resorts: Deer Valley Resort, Park City Mountain, and Solitude Mountain Resort. 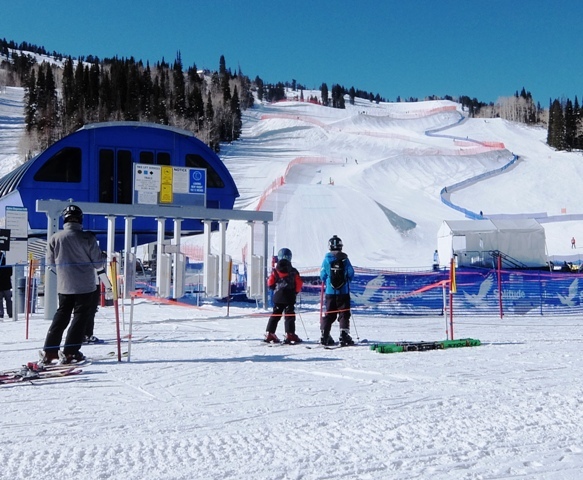 Skicross and snowboardcross take place at Solitude where a special rolly-poly course was built for the competition. As explanation, four athletes start at the same time and race for the finish. It’s similar to the Kentucky Derby where all horses start at the same time. Good luck getting in front. I was at the snowboardcross training day at Solitude. All racers could take run after run to get used to the course. There was no timing. There was no winner. It was a day for individual practice. While the words “World Championship” sounds lofty, most courses are usually super spectator friendly. I walked right up to the course, and race spectators can also. It’s like being on the 50 yard line for the Super Bowl. 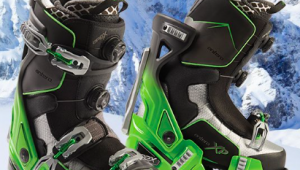 Snowboarders careened down the course, jumped the rollers, and headed for the finish. Repeat, repeat, repeat. I got bored, so I moved along to take other photos. Off to the press room to get out of the blazing sun. The press room is the sanctuary for writers and photographers from around the world. They munch on snacks, tap away on laptops, and jabber into their phones in foreign languages. 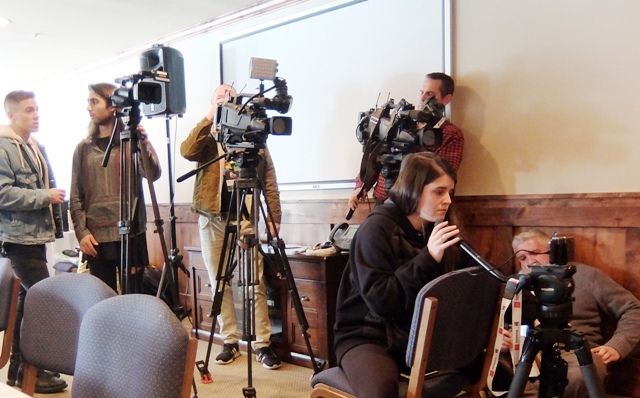 Then there’s a press conference. 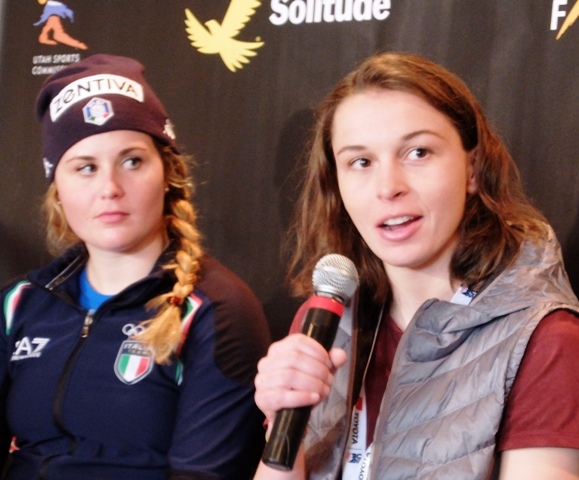 These are the faces of BoarderCross athletes — 2018 Olympic champion Michaela Moioli of Italy and U.S. snowboarder Anna Miller. They tell the press conference what it’s like out there on the course. Moioli likes the straight stretches where she can pick up speed. And Miller says she’s “ready to get the job done.” Women to watch. 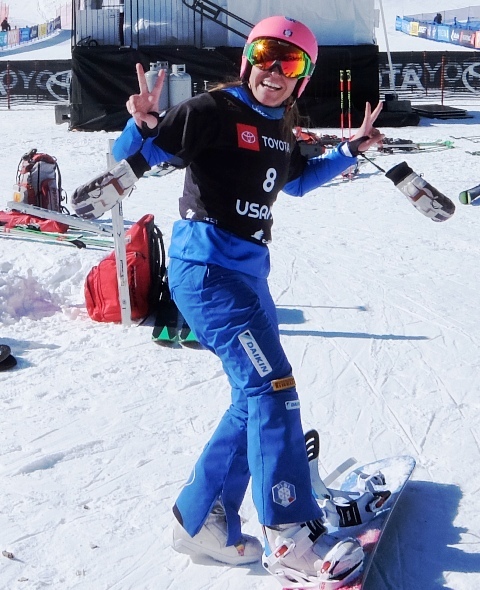 Several years ago, I happened to ski at Deer Valley on a similar World Championship training day. I stopped to watch athletes launch themselves off the “kicker” to soar, flip and spin then hope to land right side up. Their athleticism was amazing. But I’m not heavy-duty into aerials, so I went for lunch. 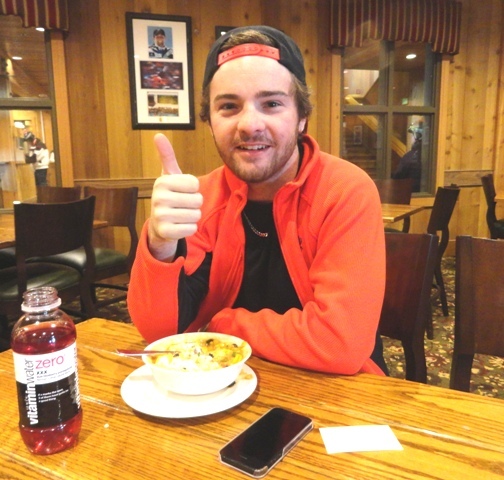 There was a guy gobbling down a big bowl of Deer Valley’s signature turkey chili. He was wearing a race ID, so I asked if he was an athlete. He introduced himself as Jon Lillis. He was fueling up before going back onto the aerial course to flip and spin upside down. Holy cow! Right after lunch! Now, at Solitude, I bumped into Jon Lillis (Rochester, N.Y.) again. He is the reigning aerial World Champion. He’s a force to watch. With 10 days of world class competition, tune-in and watch as history is made. NBC Sports will showcase more than 25 hours of 2019 FIS Snowboard, Freestyle and Freeski World Championship programming, including more than 10 hours of live coverage, on NBC and the NBC Sports networks.